I absolutely love Indian food, but here, in the Copper Country, we have no Indian restaurants and to cook it is both an art and a science. My brother John's girlfriend, Meena is from Mumbai, and last fall she cooked the entire family an Indian feast. She made Chicken Biryani, Daal Mkhani (black lentils in tomato cream sauce), Chicken Tikka Masala (the Indian dish all Americans know), Paneer Tikka Masala, Naan, Basamati Rice and Mango Lassi. It was like a dream come true and so very delicious. She did a fabulous job and cooked for about 20 people. From time to time, I make an attempt at preparing Indian food, either from package sauces or by following a recipe. I have made butter chicken, chicken curry and a few other things with limited success. Tonight, I was looking for a recipe to use up a head of cauliflower I had to use within the next 1-2 days, so I searched on Pinterest and found this. It was simple to make and the spices worked so well! 1 t whole cumin seeds. Directions: Put all the cauliflower florets in a large bowl. Combine the lemon juice, turmeric and ginger in a small bowl, then pour over the cauliflower. Add the salt, cayenne, ground cumin and fresh cilantro and mix well, using a plastic glove if preferred. Set aside for 2 hours, tossing now and then. Preheat the oven to 450 degrees F. Put the oil in a small frying pan and set over a medium-high heat. When hot, add the cumin seeds, let them sizzle for a few seconds, then pour the spiced oil over the cauliflower. Toss well. 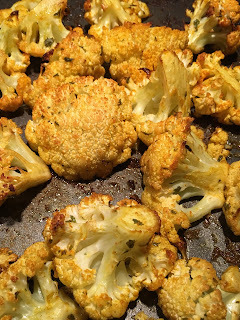 Spread out the cauliflower in a single layer in a large roasting tin. Place in the oven for 15 minutes, then turn the pieces and roast for another 10–15 minutes, or until lightly browned and cooked through.